VROG runs parkour/freerunning training and ‘trampofit’ fitness training with qualified trainers. Trampofit, trampoline bootcamp, trampofit-pilates: High energy/ low impact sessions that will make ‘feel like a child again’, whilst working on your stamina, cardio, flexibility and strength. 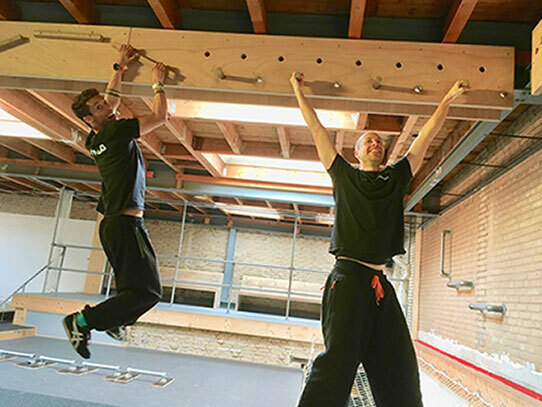 Jump, climb, balance, have fun in the freerunning hall, working on natural movements to help you build “useful strength”, improve movement and fitness. Get ‘street-ready’ or ‘race-ready’ – whether or not you want to play outside. We train with limited amount of soft mats, so that you can develop confidence and precision. Precisions, Vaults, Bounce, Wallrun, come and challenge yourself. Advanced freerunners can acquire Trainer Certification via our Parkour Academy. Bachelor and Master students UvA (also contract-student) and HvA, also part-time students. Bachelor and Master students other Dutch (daytime)universities, also part-time students. Exchange students UvA, HvA and other Dutch (daytime)universities. When enlisting you need to share your studentcard number with us. Prices: TrampoFitness 10 times card for students €75, and Freerunning/Freemove 10 times card is €100. Discount does not hold for single training price. and must be managed by member directly via online booking system. In case of injury or extended sickness, possibility to freeze the card. And our General conditions apply. Valid for 1 training per week at fixed time and day, about 38 training moments during the year. Includes 2 Trampoline tickets for free per year. Valid 1 season (2018/19: 3 September 2018 until 13 July 2019). Cancellation period is two months.